You’ve likely heard of the major credit bureaus, but do you know what the difference is and what these bureaus really do? In the United States, there are three major credit bureaus — Equifax, Experian, and TransUnion — that are competing against each other to capture, update, and store the credit histories of most US consumers. And while most of the information gathered by the bureaus is similar, there are some differences to note. For instance, one bureau may have information that is not collected by the other two — which can affect all three of your credit scores. Or, perhaps the credit bureaus use different scoring models with different credit score scales — which can also affect your credit score and the range in which it falls. As a result, it’s important to know the differences, as well as how your credit reports can vary from bureau to bureau. Why is knowing about credit bureaus important? Learning about how credit bureaus work can actually help you better understand your overall credit. While the bureaus are often lumped together, they are actually separate companies competing for the same business from consumers. So how do credit bureaus work, where they get your information, and how should you go about handling any inaccuracies you may find on your report. Source: We surveyed 200 participants in each age group, total of 600 participants yearly between 1/10/15 and 9/25/18. 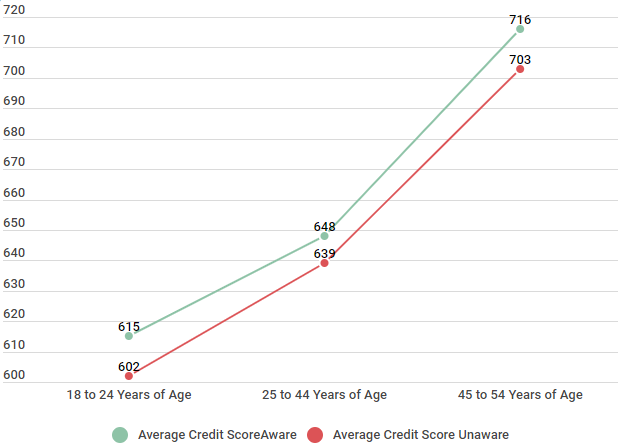 As you can see, regardless of age, those who are aware of the credit bureaus have higher credit scores across the board. And, given the importance of your credit score and how it impacts your everyday life, any chance to improve your credit score should be welcome. A credit bureau uses the info gathered on you to build and generate your credit report. They may also use this information to calculate your credit score. These reports can be used by lenders when considering whether or not to extend credit to you. As a consumer, credit bureaus are federally mandated to provide a copy of your credit report at no cost once per year. We polled some of our Credit Sesame members to find out what questions they have about credit bureaus. Here’s what they asked — and how we answered. Why do I have different scores at different credit bureaus? You may see a slight difference between the three main credit bureaus, but do not be alarmed. There are a variety of reasons why this may occur. Some lenders only report to one credit bureau and the credit bureaus do not interact with each other regarding accounts and payment due dates. Another possible reason is that each credit bureau factors certain elements slightly different. So while one may weigh an element at 30 percent, another may rate it at 35 percent, which will result in a minor difference in your credit score. Do not be alarmed at a slight difference, it is when there are large differences that requesting your credit report may show why the discrepancy exists. Is one credit bureau more important than the rest? No, however, depending on what you are wishing to increase your credit score for, it is a good idea to speak with the bank or lender to see what credit bureau they use for their calculations. Some lenders look at all three major credit bureaus, while others only look at one. Knowing what credit bureau the lender refers to can help you in making financial decisions regarding your credit score. If I improve my credit score, will this be reflected with each credit bureau? Yes, but the increase may be different among the credit bureaus, depending on what factor you used to increase your credit score. Since each credit bureau looks at factors slightly different, working on one element may increase your score by 10 with on credit bureau, but only 8 with another. One of those most common questions we heard was why your credit score might be different depending on which bureau’s report you check. Given the popularity of the question, we thought we’d explore the topic a little further. Each of the credit bureaus has their own model for calculating credit scores, as well as their own credit score range. Description: Different credit score providers (including bureaus) and their minimum and maximum ranges that can be attained by consumers. Source: Based on the VantageScore, FICO score, Equifax, and Experian credit score range model. While the high end of the range are all within 10 points of each other, the lower end shows a much larger span. In fact depending on the credit bureau it can range up to 80 point difference. This can indirectly affect the range your score is in, because each agency has different ranges as well. Having one company say that you have “good credit” may mean that you have “poor” with another, and “fair” with the third. Credit bureaus use the information they gather differently. As the chart below shows, each bureau looks at factors differently. 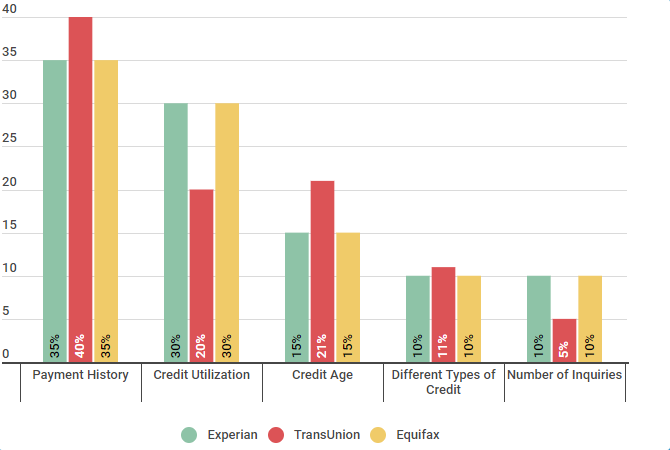 As you can see, while Experian and Equifax are similar in their weights for credit score factors, Transunion puts more emphasis on payment history and credit age, and less on credit utilization, and number on inquiries. There are few numbers in life that are as important to your financial health and well being as your credit score. These 3 simple digits can go a long way when potential lenders or creditors are deciding whether or not to work with you. But with so many different models and methods for calculating your score, it can be hard to keep track of them all. Knowing how credit bureaus work and how they generate your credit reports can go a long way toward taking control of your financial future. Each lender might look at a different bureau. For instance, when applying for a mortgage, Bank A may look at TransUnion, whereas Bank B may look at Equifax. What if your Equifax score is significantly higher than your TransUnion score? For the savvy person, this could be great information. Asking the lender “what score do you use” or “what bureau do you look at” can help you make smart decisions when it comes to choosing a lender. Always keep in mind that if you find inaccurate information on your report from one bureau, it is important to check your reports from all 3, since you’ll have to file any disputes with each individually. In conclusion, while many people tend to lump together the 3 major credit bureaus, there are actually marked differences among them. While their functions are similar, they are actually competitors vying for the business of lenders and other financial institutions. The methods they use to gather their information, as well as how they use that information to calculate your score, can vary — meaning that your scores among the 3 may vary, as well. Finding out in advance which credit bureau your lenders use can help you make smart decisions when it comes to applying for loans or credit. Very well done review of credit score ratings and the development criteria for the ratings and rating organizations. Everyone should read it before accessing credit for the first time. Perhaps it should be required to be taught in high school economics. The country might be in better financial condition if it were. Yes! Why weren't we taught this stuff in high school? Should be mandatory for all 17-18 year olds.